AHMEDABAD: Indian Prime Minister Narendra Modi and his Japanese counterpart Shinzo Abe will break ground on India’s first bullet train project on Thursday in western Gujarat state, as the country seeks faster travel for millions. Modi has pledged to invest billions of dollars to modernise India’s creaking railway system, with the bullet train one of his key election promises ahead of his landslide victory in 2014. The leaders will lay the foundation stone of the high-speed rail network between Ahmedabad – the capital city of Modi’s home state – and India’s financial hub of Mumbai on September 14, a statement by the Gujarat government said Saturday. India’s traditional railway network is the world’s fourth largest by distance and remains the vast country’s main form of travel, with 22 million passengers commuting daily. 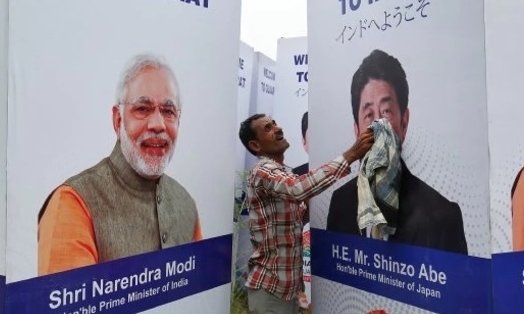 Abe’s two-day visit to Ahmedabad comes ahead of Modi’s 67th birthday on Sunday. Modi has a history of ‘birthday diplomacy’ in his home state, hosting Chinese President Xi Jinping in Gujarat on his birthday in 2014.